2 February 2017 – Some Internally Displaced Persons (IDPs) from Gwoza local government area of Borno state, have begun large scale production and packaging of various household products. The products include solid and liquid soap, detergents, pomade, hand bags courtesy of a loan allocated to them by the Borno Renaissance Micro Finance Bank, set up by Governor Kashim Shettima to promote entrepreneurship in the state. In 2016, Governor Shettima had after examining their proposal, directed the Micro Finance Bank to release the sum of N5m to a group of 91 male and female citizens displaced from Gwoza LGA, who were living within some camps in Maiduguri. The group had registered with the state as Gwoza Soap Makers Association, a cooperative desiring to go into mass production of household items. In fulfillment of their pledge, after days of hard work, representatives of the IDPs marched to the Government House, Maiduguri, with samples of household products produced and packaged by them. They named all their products, ‘G.Z. Hijira’. The ‘G.Z’ represents Gwoza, their town, while Hijira refers to a ‘temporary relocation’ which in their case, represents their Internal displacement. The IDPs told Governor Shettima that they want their locally produced items to capture the memory of their displacement and relocation to Maiduguri as a result of attacks on their communities in Gwoza by Boko Haram insurgents in 2014. “For a start, we have used part of the funds and produced 118 cartons of solid laundry soap; 86 cartons of small size pomades, 96 cartons of large size of pomade; 200 jerrycans of large and small packs of liquid soap; 1,972 kitchen sized packs of liquid soap, disinfectants and 127 numbers of women and unisex hand bags. 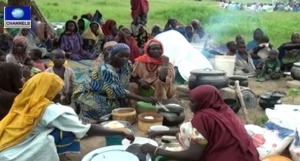 “We will be going into bigger scale production but we came to show you what we have started doing since you created this opportunity for us by encouraging us and getting us the money” leader of the IDPs, Musa Ali Gwoza, told Shettima. Impressed by what he saw, the governor ‎immediately said that after their products are certified by control agencies, they would become major features in public hospitals, schools and other Government establishments so as to increase their capacity and the economy of the state and to encourage other IDPs and residents to become productive. “You have just made my day. This is the kind of progress I love to see. You are all internally displaced persons but rather than fold your arms and wait for aide, you chose to be productive using your talents. “I encouraged you because you deserve it. I don’t know if you have gotten products certificates but I can see you are already packaging. By the grace of God, after agencies like NAFDAC and the Standard Organisation of Nigeria (SON), certify your products, we will arrange for a public presentation of your products. “I will lead the launching and the Borno State Government will make you primary suppliers of soap, detergents and disinfectants in most of our hospitals, schools and other Government establishment including this Government House so that you create jobs for others that will market and sell your products. “I will take some of your products like these detergents and test for sanitation purpose in my office. We will try to get you some machinery that will make you produce faster and in higher numbers. I believe you are using crude methods now. “You deserve encouragement. I want to mainly make you serve as role models to other citizens whether displaced or not,” Shettima said.